Purple false eranthemum is a hairless shrub from Polynesia, which grows to 7 feet in height, with rose-purple or white and purple flowers. Corolla tube usually rich purple, the petals rich pink with paler mottling or white, the throat purple-spotted; filaments and style often purple-tinged. Leaves variegated with purple or green and white. Pseuderanthemum is a genus of about 60 species of herbs and shrubs native to the tropical regions of the world. 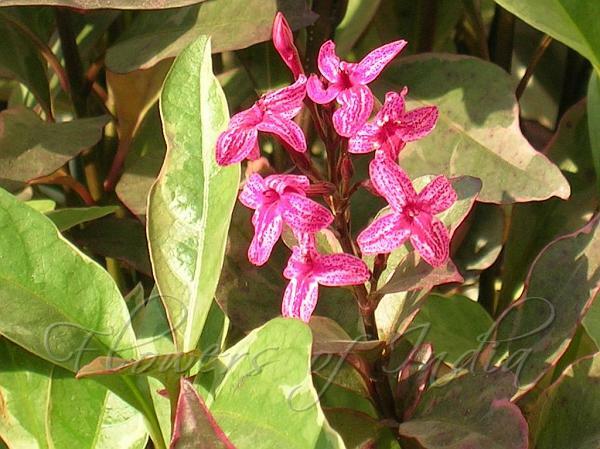 The name is from the Greek pseudo, false, and Eranthemum, the genus in which these plants were formerly placed. 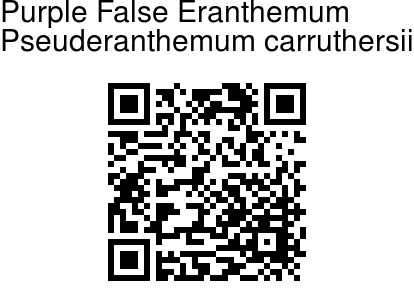 So, they are commonly called false eranthemums. Var. carruthersii encompasses both green-leaved wild plants and a cultivated form with ovate, coarsely wrinkled or net-veined-surfaced leaves with a prominent yellow zone in the central area of the blade; both forms have flowers that are white speckled with red. Var. atropurpureum has smooth, rather waxy-textured leaves heavily marked with deep red and purple, and corollas that are pink-spotted or blotched with red.